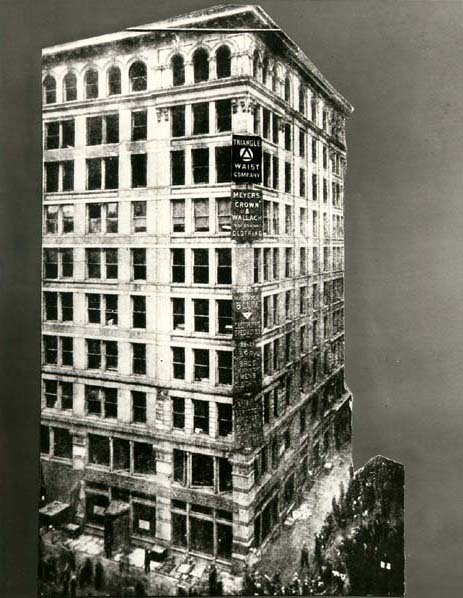 JanetheWriter is thinking about the Triangle Shirtwaist Factory fire, 99 years ago today...and my father's aunt who was scheduled to start work there on Monday, March 27, 1911. Your coverage is much appreciated. Many thanks for this note, Ms. Herman. And good for your great-aunt's timing. It may have saved her life. She wrote back with this: “My mother spoke to me often about the fire. I have an idea she may have been a spectator, having lived on the Lower East Side at the time. She was able to relate in great detail. Soooo, my feeling is that the great aunt that dad speaks of is my mother's Aunt Ray. Ray lived on the west side of Manhattan, actually in Fort Washington. She had a doll hospital in a store front on Broadway and about 179th Street. She lived not far from the store on Wadsworth Avenue. My mother and Ray had a very close relationship and Mom would very often take the crosstown bus and visit her. When I was able to travel by myself I would also very often visit Ray. I loved her. If you want more history, I'll try to jog my memory. Yes, Aunt Bea, please try to jog your memory. I’d love to know more about lucky Aunt Ray and the rest of her mishpucha.